All five spacious rooms have been tastefully refurbished and designed for comfort and offer full en-suite facilities with both baths and showers. A choice of family, double or twin rooms with no minimum night stay however a £10 supplement is applicable for one night only. A cot is available at £5 per stay. Discount is available for long term bookings and NHS staff. Rooms are on a "room only" basis however breakfast essentials are provided on a help yourself basis. All five spacious rooms have been tastefully refurbished and designed for comfort and offer full en-suite facilities with both baths and showers. Our spacious Family Room, situated on the Ground Floor, is perfect for 2 adults and 2 children (up to 12 years old) or for 2 adults who like extra space and want to kick back and relax after a busy day sightseeing. The room offers warm soft tones for a relaxing nights stay, and for those with children, the sofa converts into a sofa bed with a comfortable memory foam mattress. The window's plantation shutters give a clean and simple elegance to the room whilst allowing guest privacy and light control. 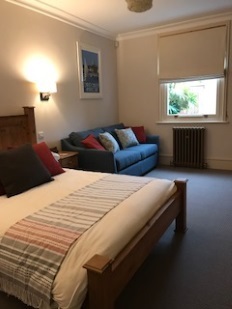 Our bright and airy dual aspect Twin Room, situated on the Ground Floor, is ideal for sharing with a friend or work colleague or suitable for additional older siblings next door to the Family Room. This contemporary style room combines oak furnishings with modern neutral colours to create a space that invites relaxation. The window's plantation shutters give a clean and simple elegance to the room whilst allowing guest privacy and light control. Our quirky Double Room, situated on the First Floor, has a high ceiling within which contains a small window, which although gives no view, is still quite light when combined with the roof lantern in the bathroom ceiling. Perfect for guests who prefer a cosier, quieter, darker room for a good night's sleep. The electric blind in the window can be operated by a remote control. Our single aspect Double Room, situated on the First Floor, is softly decorated with creams and yellows and has views of St Mary's Longfleet Church spire and Poole Hospital. The window's plantation shutters give a clean and simple elegance to the room whilst allowing guest privacy and light control. Our dual aspect Double Room, situated on the First Floor, is the brightest of all the rooms and has views both of St Mary's Longfleet Church spire and Poole Hospital. Both windows have plantation shutters giving a clean and simple elegance to the room whilst allowing guest privacy and light control. All rooms come with the following facilities.